Latin name: Coleosporium asterum (Diet.) Syd. 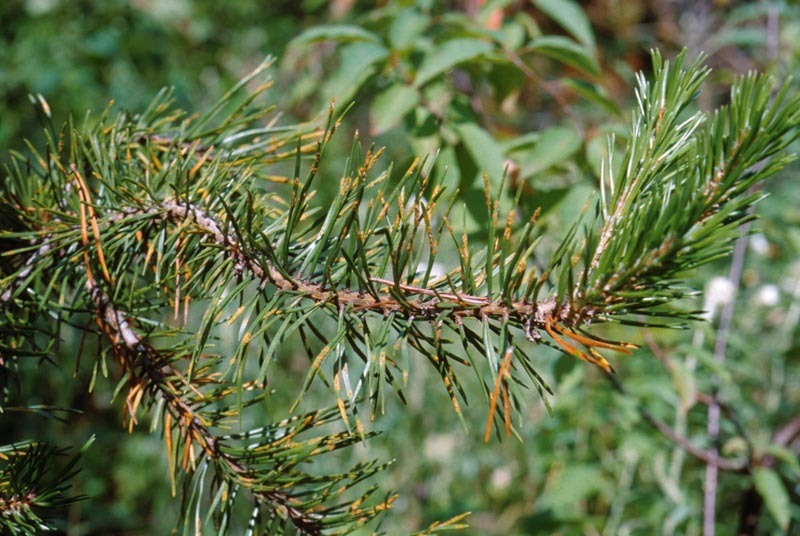 Common throughout the range of host trees in Canada. 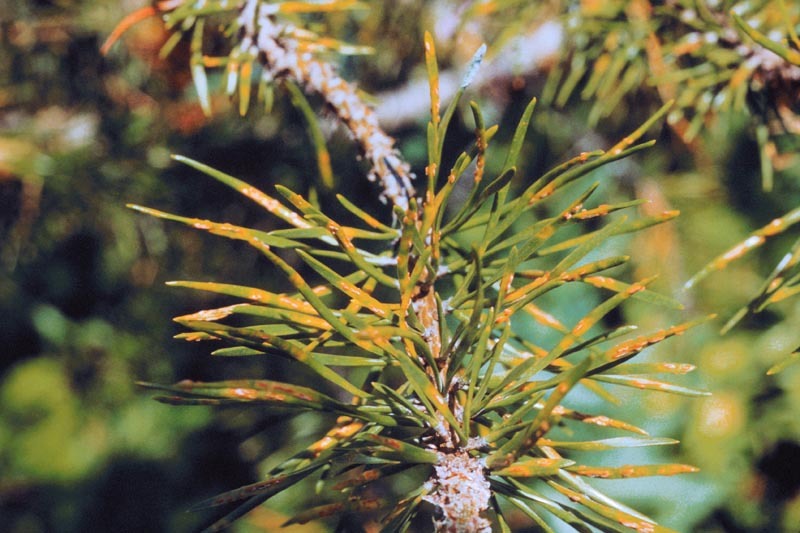 The pine-aster rust causes minor needle cast and discoloration of needles of pine and, in cases of severe infection, some reduction in terminal growth, but only rarely does it kill trees. 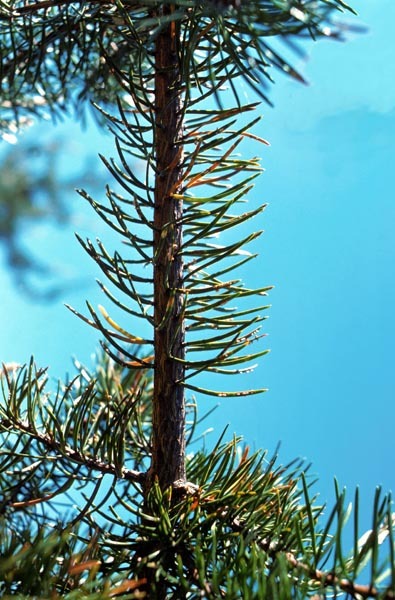 Generally, only relatively small trees, less than 8 to 10 feet in height, are affected, and only heavily infected older needles are cast prematurely, resulting in lowered food production, consequent growth reduction, and reduced value for Christmas trees. 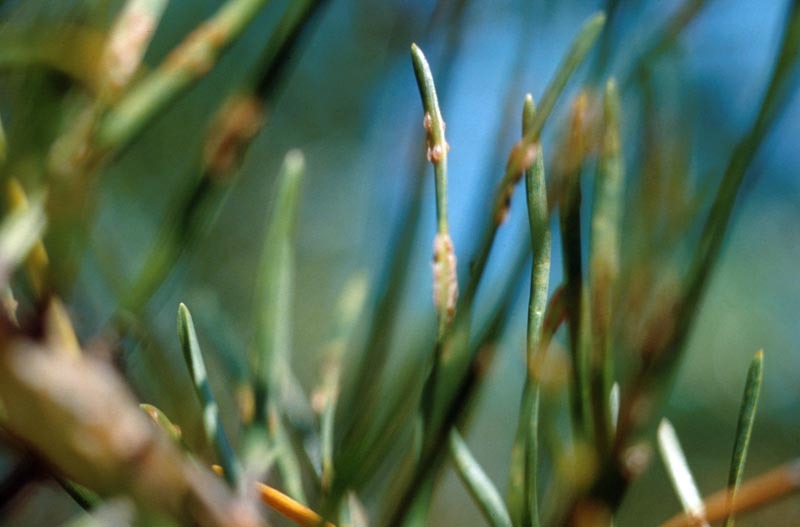 However, death of seedlings could result from a combination of rust attack and insect attack fatal to the new shoots. 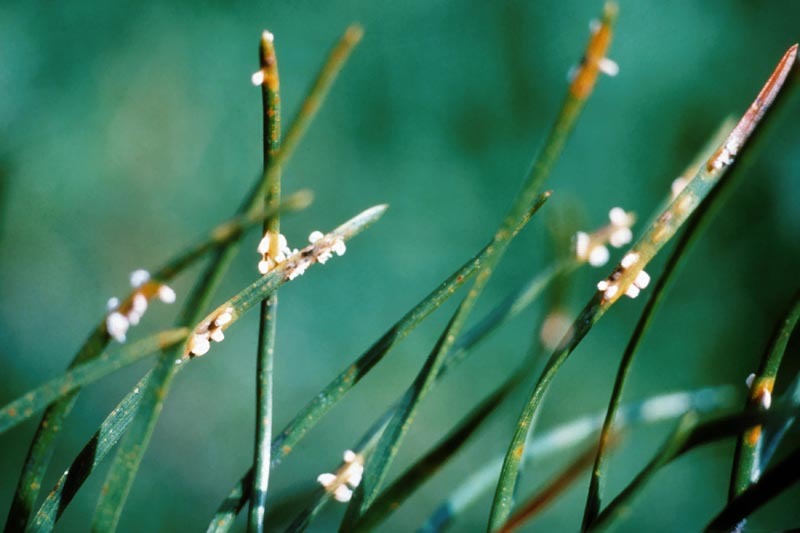 Coleosporium asterum is a macrocylic rust, producing five spore stages. 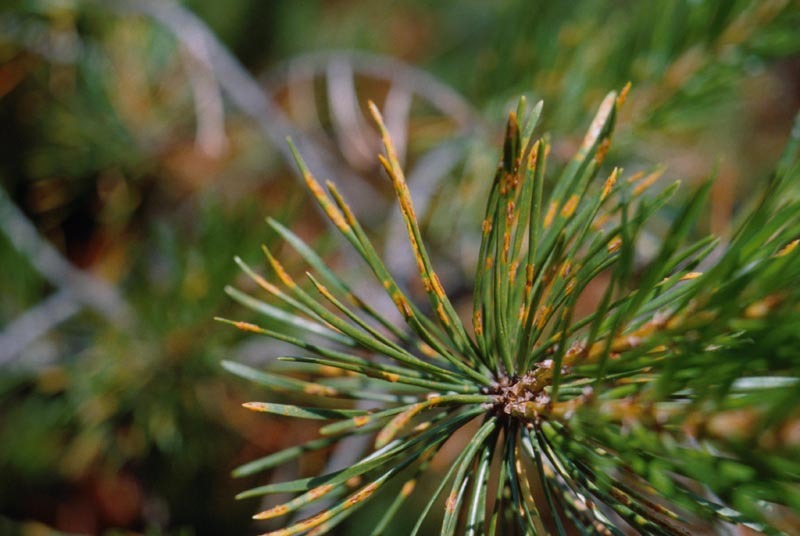 In the early spring the pycnial stage appears as orange droplets on lesions on pine needles that were infected the previous fall. 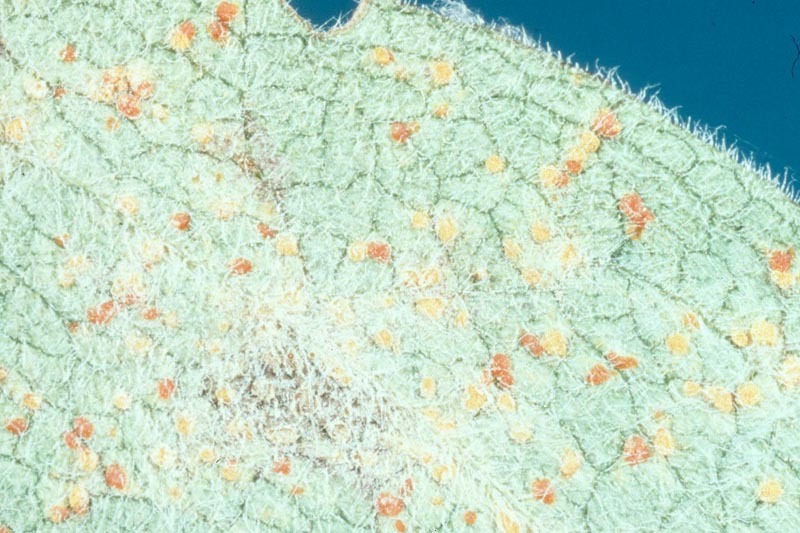 A white, columnar blister, the aecial stage, then forms on the needles in late spring or early summer, ruptures and releases orange-coloured aeciosporess that are dispersed by the wind and infect the alternate hosts, aster, Aster sp., and goldenrod, Solidago sp. 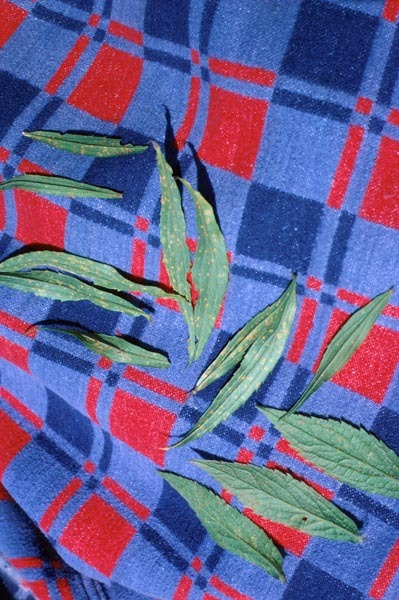 Throughout the summer, on the underside of the leaves of the alternate host, the uredial stage develops and produces orange, cushion-like masses, which produce uredialspores that re-infect and spread the disease to other aster and goldenrod plants. Several generations of this stage may be produced during the summer months. 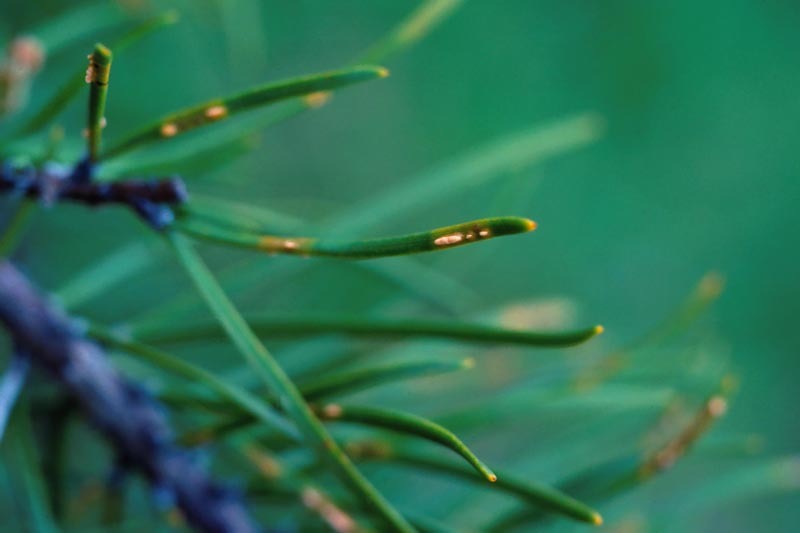 In late summer, the telial stage develops on the underside of the alternate host leaves, germinates and produces the basidial stage, which releases basidiospores that are dispersed by the wind and re-infect the needles of the primary pine host, where the fungus then overwinters. The current year’s foliage that is infected late in the fall usually dies and falls from the tree the following summer. 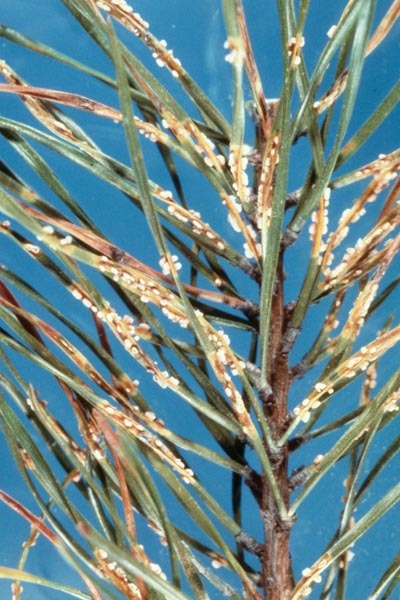 In some cases the infected needles will persist on the tree for 3 to 5 years. 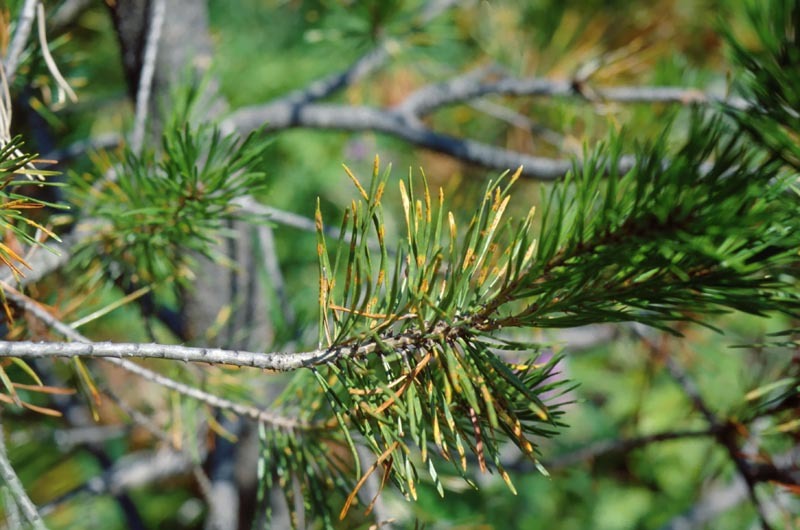 Infections that result in whole tree mortality are rare because the current year’s needles are not affected until late in the fall, after the growing season is completed. 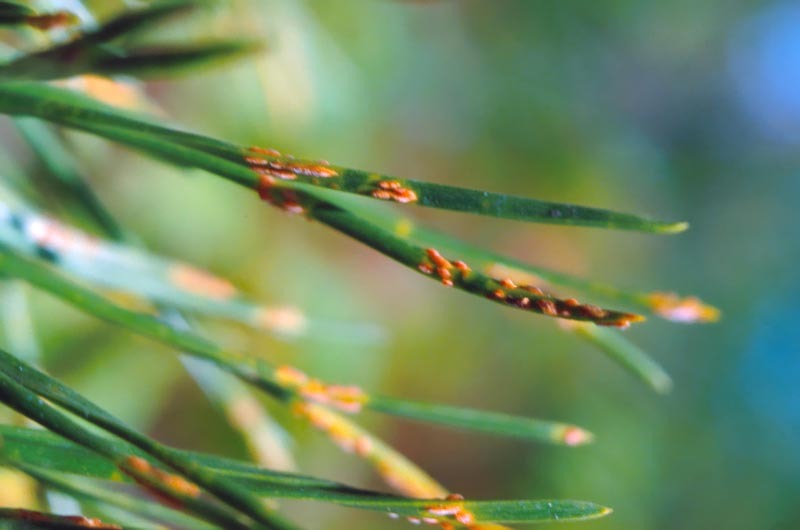 Consecutive years of infection, accompanied by an additional stress, such as drought, could result in loss of vigour, growth loss, and whole tree mortality. 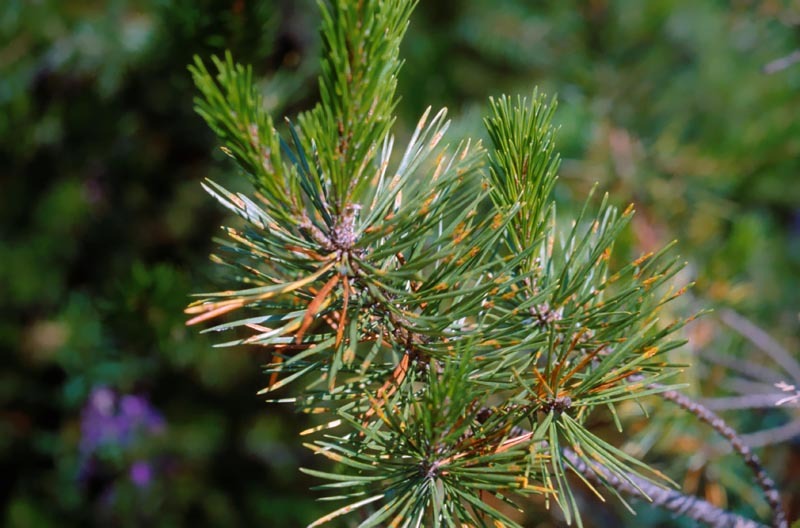 Less vigorous trees are more susceptible to attack by other insects and diseases, such as bark beetles, Ips sp., and Armillaria root rot, Armillaria ostoyae (Romagn.) Herink. 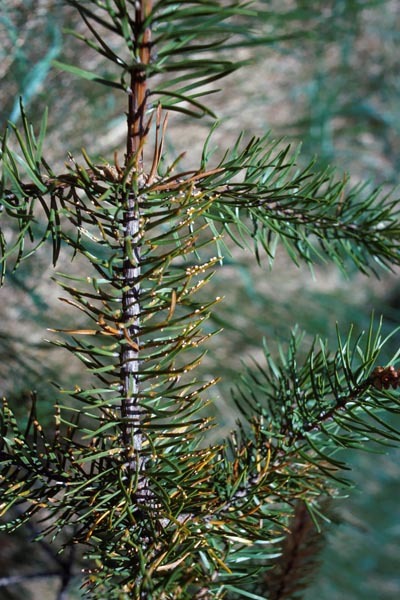 The result of several consecutive years of defoliation can reduce the merchantability of trees in the Christmas tree and ornamental tree industry. 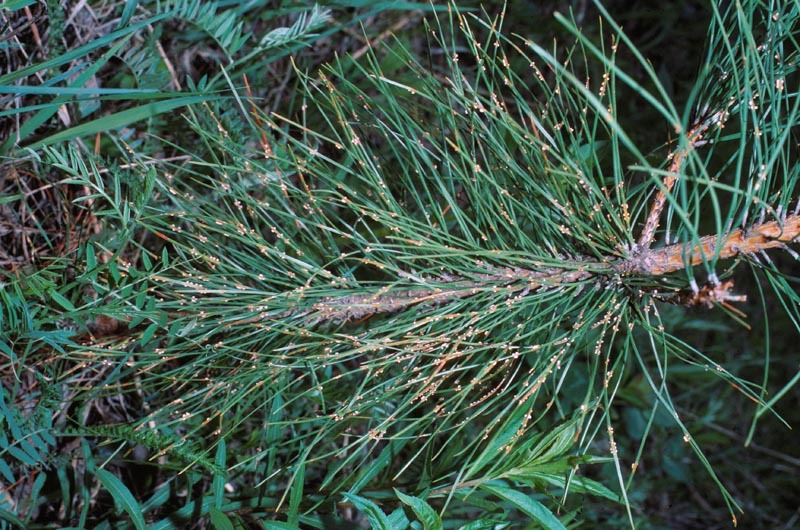 In these cases, an application of a fungicide registered for control of this pine needle rust is recommended. 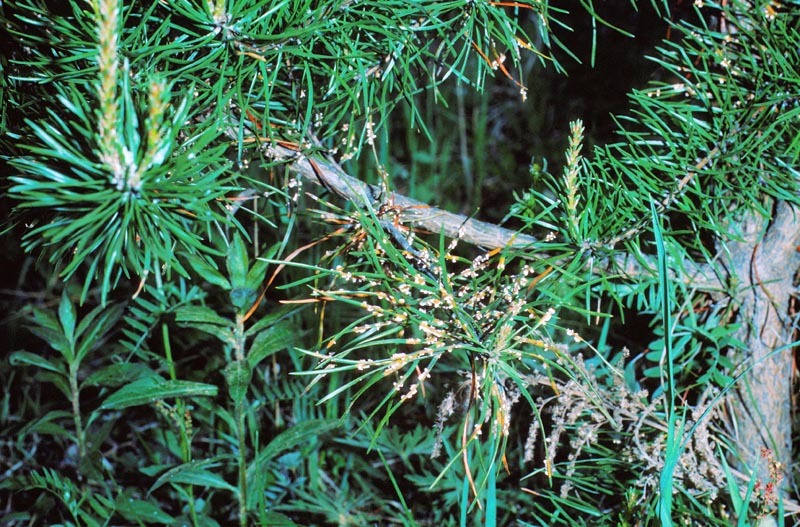 The removal of any alternate host plants, aster, Aster sp., and goldenrod, Solidago sp., from within 300 m of pine plantings should also provide some level of control. 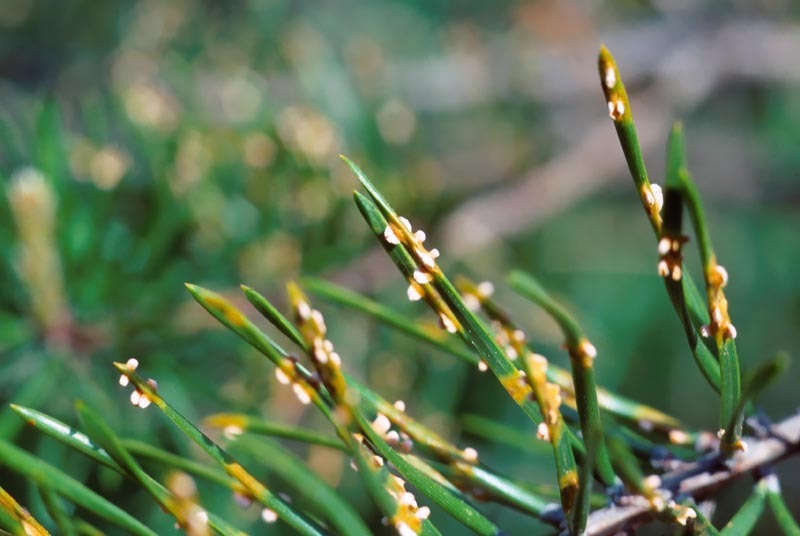 Primarily jack, red, and Scots pine; occasionally pitch pine; alternate hosts are various species of aster, Aster sp., and goldenrod, Solidago sp. 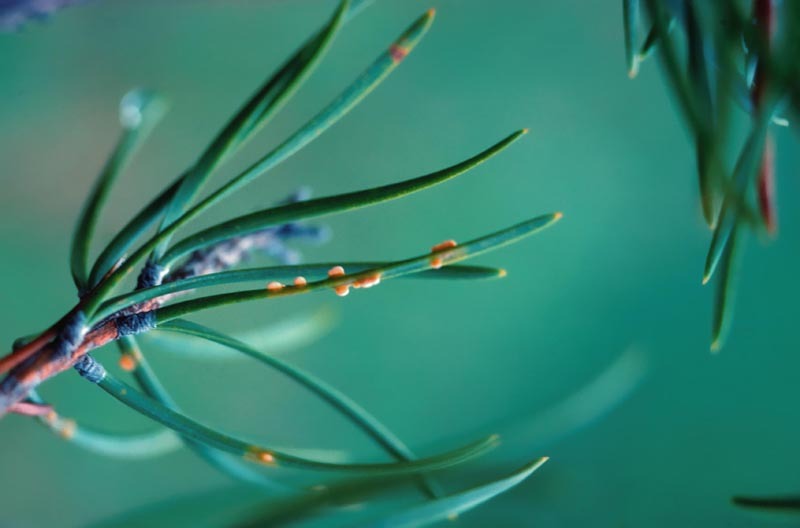 As with most tree rusts, pine-aster rust requires two botanically unrelated host plants to complete its life cycle. 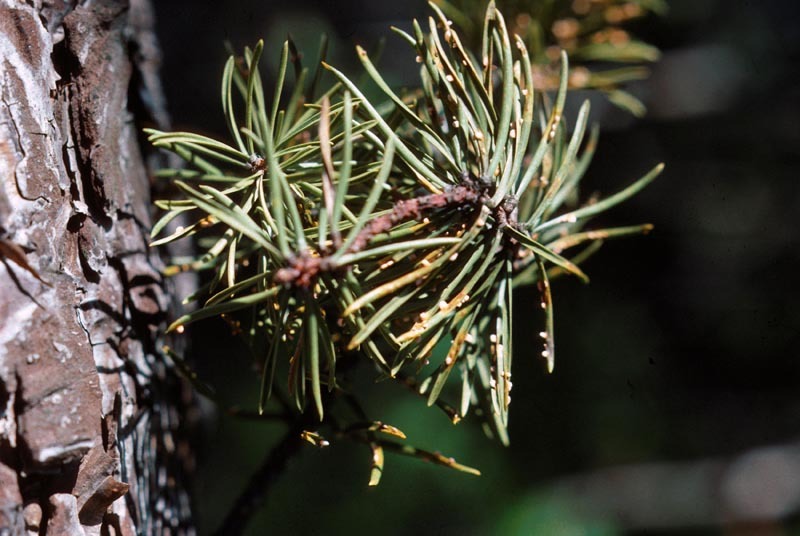 The primary or aecial hosts are lodgepole pine, jack pine and Scots pine. 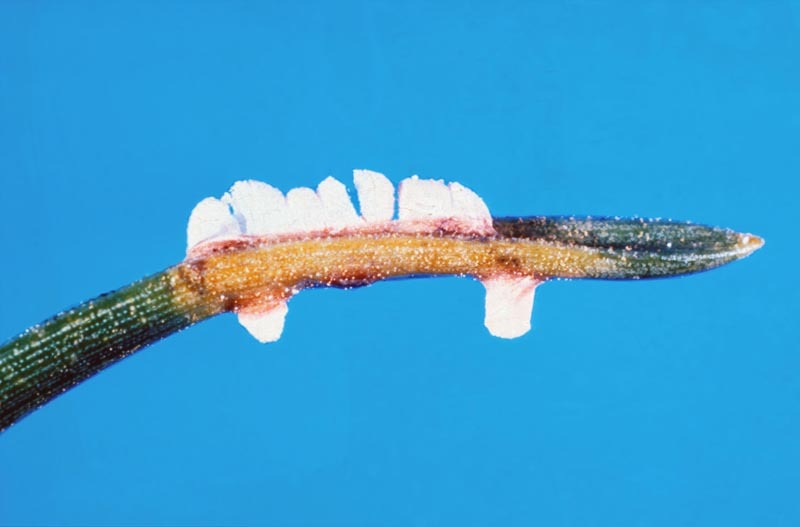 The main secondary or telial hosts are species of asters and goldenrods, but China-aster and gumweed are also susceptible. 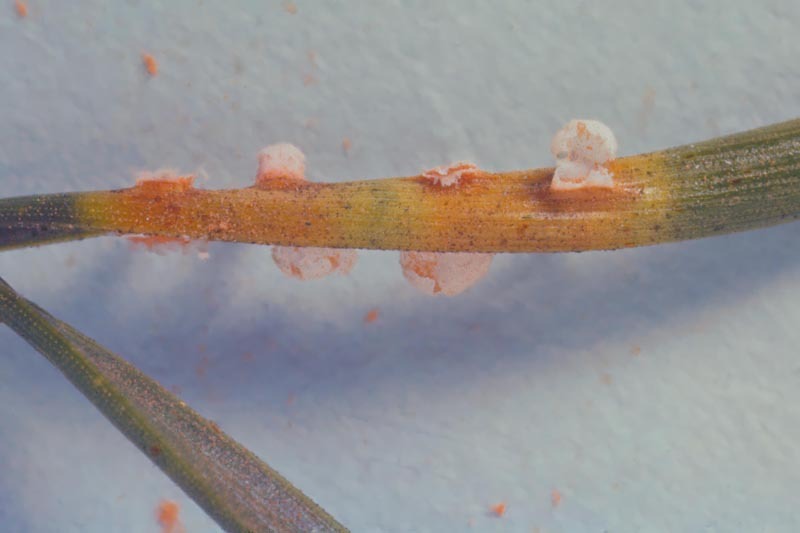 Fruiting of Coleosporium asterum, the cause of pine needle rust, on its alternate host, goldenrod. 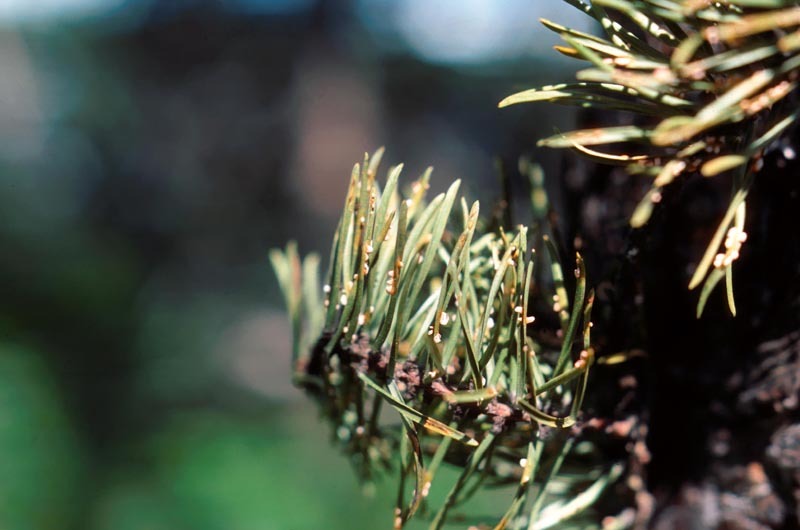 The reddish pustules produce spores that infect pine. 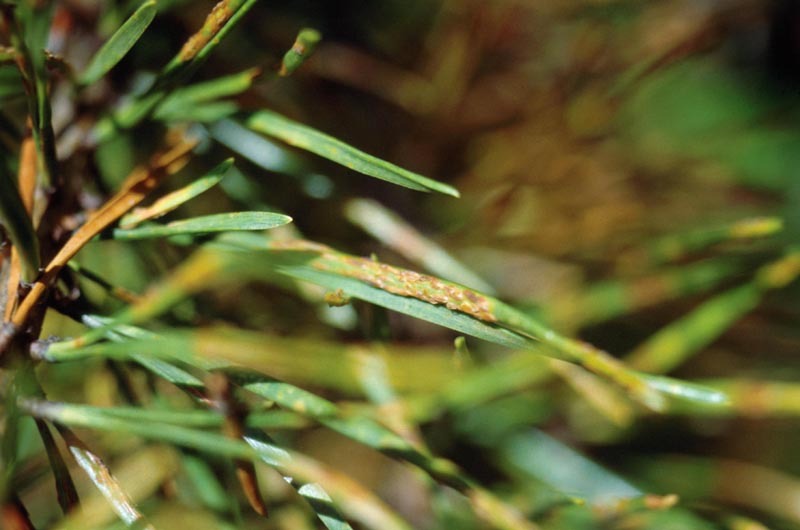 Coleosporium asterum, the causal organism of pine needle rust, fruiting on red pine needles.